It is estimated that there are more than 1,200 women suffering from fistula and need reparative surgery in Liberia. In this nation roughly the size of Tennessee, currently there are fewer than 10 OB physicians in the entire nation who can provide this care. Even when one of those physicians is available, there may not be adequate medical support or supplies to offer the healing that's needed. Direct care from visiting medical professionals and donated medical supplies remain crucial elements in helping Liberians address the fistula epidemic. The value of medical services and supplies cannot be overestimated -- the needs are dire -- but more is required for true, holistic healing to take place, both on an individual and community level. We travel to Liberia in order to be present with women who suffer. Meeting them eye to eye and heart to heart, we aim to help them reconnect with their own sense of value and self-worth through our simple offerings of kindness, respect, and love. Our prevention-oriented projects, including medical education and paramedical programs like the maternity waiting home, are designed to equip communities to regain the ability to care well for their citizens. By providing resources, training, and tools, we're fostering long-term well being for the better. Liberia is a beautiful nation in West Africa. Recent years in Liberia have been devastatingly difficult as civil war has ravaged the country politically, economically, socially, emotionally, and physically. The challenges in Liberia are significant and wide-spread. There are no quick fixes in Liberia, no short cuts, no easy paths. But there is a lot of hope. That's why healing is so important -- and possible. Women suffer with fistula in many places in the world, but we work in Liberia because our relationship with Liberia is personal. Multiple Dignity:Liberia Board members have lived in in this beautiful country and remain connected there. So we’re not just working for a cause; we’re serving people we know and love. We take teams to Liberia to encourage and support women awaiting or recovering from fistula surgery, helping them to heal from the inside out. With our local contacts, we identify areas in need of access to direct medical care and medical education. We facilitate service trips for teams of healthcare professionals , including physicians, nurses, counselors, and others. Many basic but essential medical supplies remain difficult to obtain in Liberia. We collect and ship much needed supplies to local hospitals and clinics. Access to medical care will remain an issue for years to come. We're working to build a safe, home-like space where women with high risk pregnancy can live in close proximity to essential medical care as they await delivery. 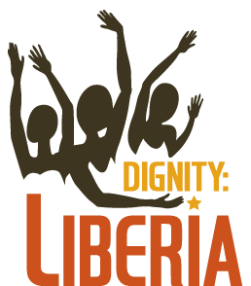 Talking about Dignity:Liberia is our favorite thing to do! Let's connect.